With just a few days to go before Remembrance, The Intellectual Property Office (IPO) and The Royal British Legion are urging members of the British public to be extra vigilant when buying poppy merchandise for Remembrance this year. Their donations are intended to support Armed Forces community men, women, veterans and their families. Instead they could end up benefitting fraudsters if their poppy merchandise turns out to be fake. The IPO and The Royal British Legion have teamed up with the Police Intellectual Property Crime Unit (PIPCU) to crack down on the rogue traders making money from the fake Remembrance goods. The warning applies to poppy merchandise - scarves, jewellery, poppy pins and larger poppy brooches. This does NOT apply to the traditional paper poppies. Last week, Manchester City Council’s Trading Standards team seized more than 1,700 items of fake poppy merchandise destined for sale to the British public. The PIPCU team has been targeting suspected sellers by visiting addresses and speaking with people in connection with this crime. In Autumn 2017, Border Force officers at Tilbury intercepted a shipment of poppy merchandise intended for the UK worth in the region of £150,000. “It is a sad fact that there are people who actively defraud the public in order to take funds intended for the support of our Armed Forces community. 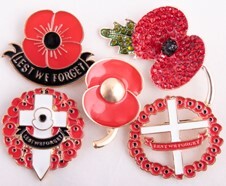 We would urge everyone wishing to purchase a Remembrance poppy brooch, to do so through official channels. For example, you can buy from one of our trusted volunteers, from The Royal British Legion’s online Poppy Shop, or from one of our corporate partners. “Join with us, the IPO and PIPCU to help make sure your donation doesn’t line the pockets of criminals. We want to make sure that it goes to supporting those who have made such a unique contribution to our society”.